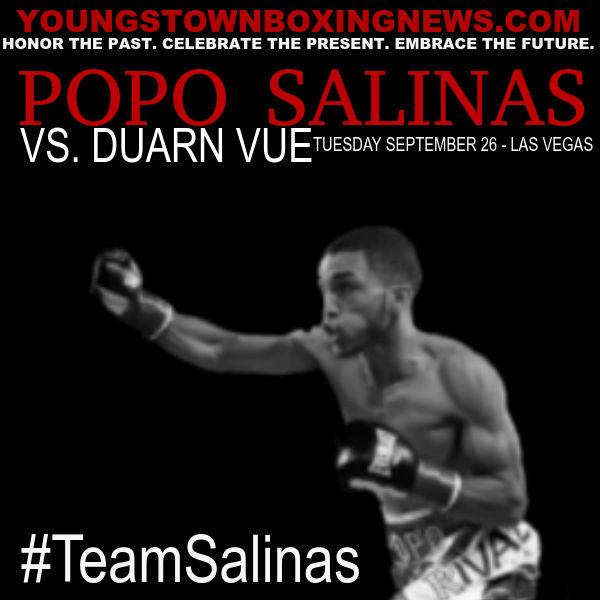 It's fight day here in Las Vegas as Alejandro "Popo" Salinas will be taking on Duarn "The Storm" Vue in what promises to be a entertaining fight as the co-feature on tonight's televised card at the Cannery located in the northern part of Las Vegas. 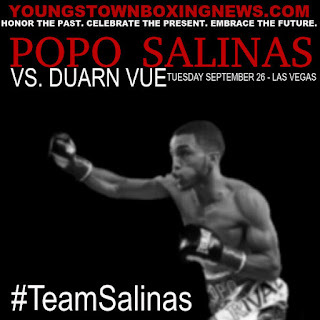 Salinas will come into this bout with a record of 8-1 with 8 knockouts while Vue sports a perfect 12-0-2 record with only 4 knockouts. The difference between Salinas and Vue does not stop at power. Salinas, who weighed in at 129.4 pounds will have a significant height advantage against the 5'3" Vue, who hails from Madison, Wisconsin. Vue, who weighed in on Monday night at 127.6 pounds will not be deterred however by the height difference. Known as The Storm because of relentless style of fighting forward and throwing punches at a high rate, the best chance Vue has in winning this bout is outworking the stronger, and bigger Salinas and letting the judges decide the winner of the scheduled 8-round bout. Though he sports a perfect record, Vue has not seen a boxer that hits anywhere as hard as Salinas. My official prediction for tonight's bout is Salinas in five rounds in what will be a very eventful and entertaining fight. Fans wishing to watch tonight will be able to do so on Fox Sports 1 starting at 9:00PM EST. Also fighting on tonights card will be Vic Toney. Toney, a former Chaney High School football standout has relocated to Las Vegas within the last year and will be fighting for the first time since March of 2016. The task at hand for the 5-0 Toney will be a tall one as he will be taking on 4-0 Sebastian Fundora, a 19-year-old 6'6" middleweight from Florida who now trains in California. The main event for tonight's card will feature two undefeated prospects which is being billed as Cuba versus Mexico as Leduan Barthelemy takes on Eduardo Ramirez. Barthelemy will bring a perfect of 13-0 into the bout while Ramirez sports an unblemished 20-0-2 record into this highly anticipated super featherweight clash. Fan's can follow @YtownBoxingNews on Twitter and Instagram for updates or like us on Facebook.